Target isn’t the only game in town when it comes to the discount designer collection, though you’d hardly know it if you shop according to media buzz. Discount department store, Kohl’s stays relatively under the radar when it comes to promotion of their specific collabs, a fact that I view as a blessing– it just means MORE FOR ME! 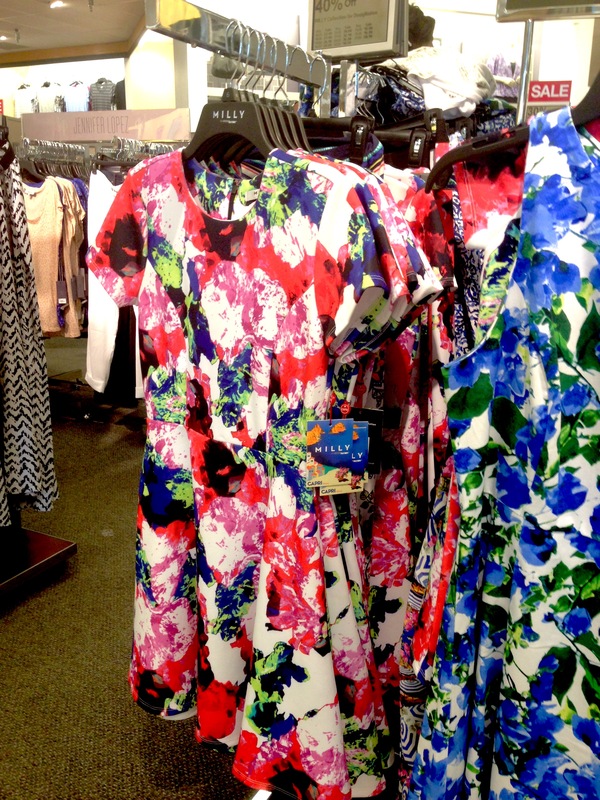 Don’t sleep on Kohl’s DesigNation; it has definitely helped make Kohl’s a worth destination. Kohl’s debuted the Milly for DesigNation capsule collection this spring, making it the sixth designer collaboration under the DesigNation umbrella, that began in 2012 with Narciso Rodriguez. Collabs with Thakoon, Derek Lam and most recently, Elie Tahari, followed. 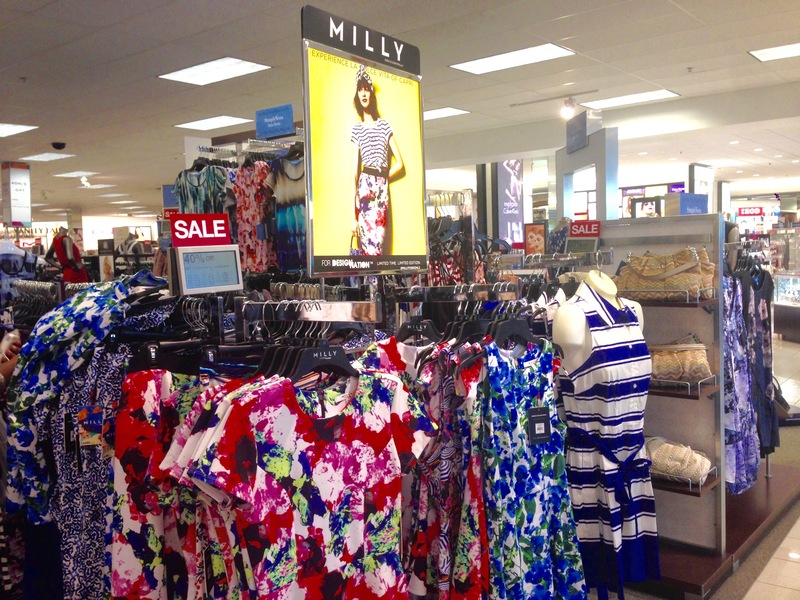 I love Milly for the vibrant and playful use of color and pattern, and this collection is supposed to transport you to a whimsical day spent lounging in Capri. I stumbled on it quite by accident. I needed a dress for an event I was going to be attending with my family. My mother’s directives were clear: you had better look nice (duh!) and after-work business attire was recommended. As my job requires little more than nice jeans, that meant it was dress up time! I wanted an outfit that was colorful and sophisticated, playful but not outlandish for an office setting. 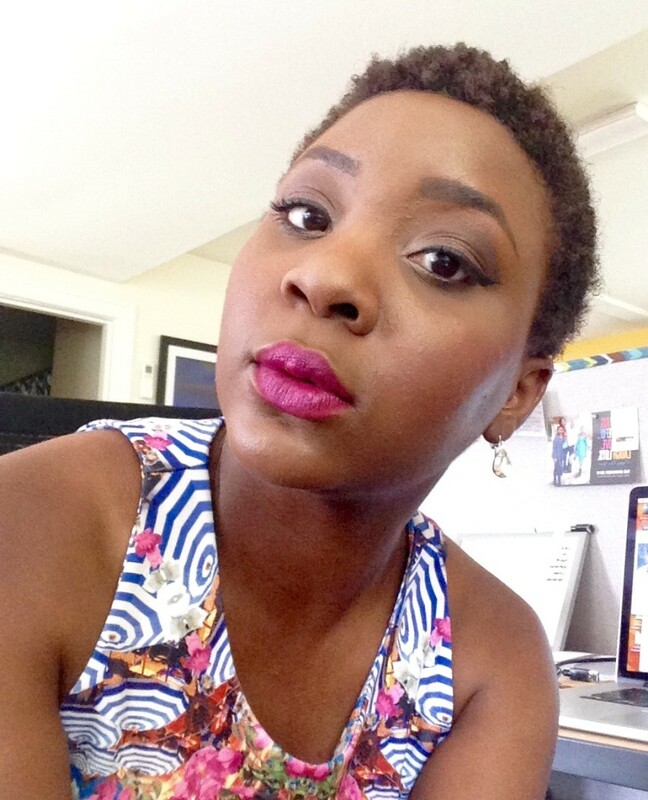 I kept my makeup vibrant but day-to-night appropriate, pairing a colorful (dusky purples–“Mulberry”, “Chocolate” and “Ballet” Color Impact Shadows— as nudes and Liquid Perfection Eyeliner in Black) but neutral eye with a vibrant lip ( “Magenta” HydraBrillance Lipstick paired with Beauticontrol’s Sheer lip color in the frosty “Electric Purple”). The vibrant sheath scuba dress has a figure-skimming cut and features a black exposed zipper, giving the sheath a bit of edge. The event was a huge success. My forever friend, Ronald was in town to be the keynote speaker and inspired the entire audience. Even though I’ve known him since I was six and THOUGHT I knew his story, listening to him inspired a new direction for me too…I’ll be revealing more about that soon! He and I had a blast exploring the location, a place that is near and dear to our hearts. What is now the Chesterfield Career and Technical Center at Hull used to be Clover Hill High School– our good old neighborhood high school got one hell of a makeover! We had a bit of an extended photoshoot and Ron’s skills with the iPhone caught me and this dress in perfect, playful action. Are you a fan of designer collaborations? What is your favorite collab and what are you looking forward to in the future? Are you planning on shopping Milly for DesigNation? The Right Style is dedicated to helping women discover and acknowledge their unique beauty and learn to see themselves the way that others see them. Through the use of image consulting, women will learn how to best take care of their skin and discover colors and techniques that can be used to enhance their natural beauty. Want to take selfies that WOW? Sign up for The Right Style newsletter and get my gift to YOU, Get That Video! : Make Great Videos On The Go! SPAM is the WORST. I will never sell your info to a third party.